All capacities shall be taken to the nearest 1 (one) kip, loads shown on plans. Steel piling shall be ASTM A709 (Grade 50) steel. Length shall be pile length + 10’. When test piles are specified to be driven-in-place they shall not be included in the number of piles indicated in the “PILE DATA” Table. When Load Test Pile are specified, the nominal resistance value shall be determined by an actual load test. For preboring for piles see Sec 702. The foundation can be more economically designed with increased geotechnical information about the specific project site. Soil information should be reviewed for rock or refusal elevations. Auger hole information and rock or refusal data are sufficient for piles founded on rock material to indicate length of piling estimated. Standard Penetration Test information is especially desirable at each bent if friction piles are utilized or the depth of rock exceeds approximately 60 feet. A nonredundant pile group is a pile group of less than five piles. Resistance factors should be reduced by 20% for nonredundant pile groups. Greater reductions (additional 20%) should be considered when single pile supports an entire bridge pier. Waterjetting is a method available to contractors to aid in driving piles. If the drivability analysis indicates difficulty driving piles then it can be assumed that the contractor may use waterjetting to aid in driven the piles. The Commentary on Waterjetting discusses items to consider when there is a possibility of the use of waterjetting. HP 10 x 42 12.4 sq. in. HP 12 x 53 15.5 sq. in. HP 14 x 73 21.4 sq. in. The HP 10 x 42 section should generally be used unless a heavier section produces a more economical design or required by a Drivability Analysis. The same size pile must be used for all footings on the same bent. Pile size may vary from bent to bent. 1 Use only with SPM approval. Use minimum wall thickness which is preferred. When this wall thickness is inadequate for structural strength or for driving, then a thicker wall shall be used. Specify the required wall thickness. For 5/8” pipe pile which is less commonly available, it may be specified on the plans and noted as a minimum. 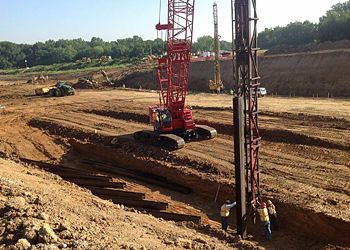 The contractor shall determine the pile wall thickness required to avoid damage during driving or after adjacent piles have been driven but not less than the minimum specified. *For scour, estimated maximum scour depth (elevation) must be shown on plans. Guidance Note: Show maximum of total scour depths estimated for multiple return periods in years from Preliminary design which should be given on the Design Layout. Show the controlling return period (e.g. 100, 200, 500). If return periods are different for different bents, add a new line. Pile point reinforcement shall be required for all HP piles required to be driven to bear on rock regardless of pile strength used for design loadings or geomaterial (soils with or without gravel or cobbles) to be penetrated. For CIP piles, use pile point reinforcement if boulders or cobbles or dense gravel are anticipated. 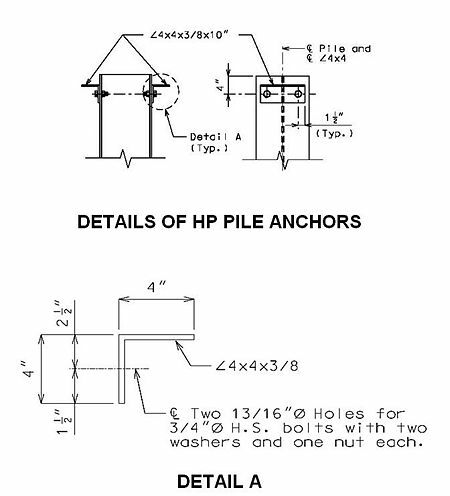 Use standard seismic anchorage detail for all HP pile sizes. Modify detail (bolt size, no. of bolts, angle size) if seismic and geotechnical analyses requires increased uplift resistance. Follow AASHTO 17th Ed. LFD or AASHTO Guide Specifications for LRFD Seismic Bridge Design (SGS). Note: Galvanizing ∠4x4, ¾” diameter high strength bolts, washers and nuts will not be required. Determine foundation load effects from the superstructure and substructure for Service, Strength and Extreme Event Limit States. If applicable, determine scour depths, liquefaction information and pile design unbraced length information. Determine if downdrag loadings should be considered. Select preliminary pile size and pile layout. Perform Pile Soil Interaction (DRIVEN) Analysis. Estimate Pile Length and pile capacity. Based on pile type and material, determine Resistance Factors for Structural Strength . Determine Resistance Factor for Geotechnical Strength . If other than end bearing pile on rock or shale, determine Nominal Axial Geotechnical Resistance for pile. Determine Factored Axial Geotechnical Resistance for single pile. Determine Nominal pullout resistance if pile uplift reactions exist. Check for pile group effects. Show proper Pile Data on Plan Sheets. Pile structural resistance factor for axial resistance in compression and subject to damage due to severe driving conditions where use of pile point reinforcement is necessary. For HP piles, pile point reinforcement is always required when HP piles are anticipated to be driven to rock and proofed. Driving HP piles to rock is considered severe driving conditions for determination of structural resistance factor. Pile structural resistance factor for axial resistance in compression under good driving conditions where use of pile point reinforcement is not necessary. For HP piles, pile point reinforcement is always required when HP piles are anticipated to be driven to rock and proofed. However, driving HP piles through overburden not likely to impede driving to deep rock or preboring to rock for setting piles are two situations that could be considered as less than severe. Further, driving any steel pile through soil without rubble, boulders, cobbles or very dense gravel could be considered good driving conditions for determination of structural resistance factor. Consult the Structural Project Manager or Structural Liaison Engineer. The Geotechnical Resistance factor is dependent on method of pile driving acceptance criteria during Construction. Use dynamic pile testing on all jobs where any-sized HP piling is driven to shallow rock which is defined as rock up to 30 ft. - 35 ft. below ground. This requirement shall apply to any type of rock meaning weak to strong rock including stronger shales where HP piling is anticipated to meet refusal. Use EPG 751.50 Standard Detailing Notes E2.22 and G7.3 on plans as required. FHWA-modified Gates Dynamic Formula is not considered accurate for pile loading exceeding 600 kips Nominal Axial Compressive Resistance. When pile loading exceeds 600 kips, use wave equation analysis and geotechnical resistance factor of 0.50. See Structural Project Manager or Liaison for use of Pile Dynamic Testing. Dynamic Testing is recommended for projects with friction piles and when HP piling is driven to shallow rock. Downdrag, liquefaction and scour all reduce the available skin friction capacity of piles. Downdrag is unique because it not only causes a loss of capacity, but also applies a downward force to the piles. This is usually attributed to embankment settlement. However, downdrag can also be caused by a non-liquefied layer overlying a liquefied layer. Review geotechnical report for downdrag and liquefaction information. The PNDC were calculated with the assumption that the piles are continually braced. This includes the portion of piling that is below ground or confined by solid wall encasement. For portions of piling that are not continually braced, the PNDC must be calculated taking the unbraced length into account. Since we are assuming the piles are continuously braced, then . If designing a pile bent structure, scour exists or liquefaction exists then pile shall be checked considering the appropriate unbraced length. Steel Shell is ASTM 252 Grade 2 (35 ksi) or Grade 3 (45 ksi). ASTM 252 allows “the wall thickness at any point shall not be more than 12.5% under the specified nominal wall thickness.” AASHTO recommends deducting 1/16” of the wall thickness due to corrosion. Area of steel shell used in design equations should deduct 12.5% and 1/16” where applicable. The maximum factored load per pile must be less than or equal to PFDC for the pile type and size chosen. If not, the pile size must be increased or additional piles must be added to the pile group. Reanalyze until the pile type, size and layout are satisfactory. The minimum factored load per pile should preferably be greater than zero. If this cannot be practically satisfied, the factored pullout resistance of the pile shall be calculated. The estimated pile length will be determined from Pile Soil Interaction (DRIVEN) Analysis. The factor of safety used for this analysis shall be discussed with the appropriate Structural Project Manager or Structural Liaison. The estimated pile length is the distance along the pile from the cut-off elevation to the estimated tip elevation considering any penetration into rock. The estimated tip elevation shall not be shown on plans for end bearing piles. The geotechnical material above the estimated end bearing tip elevation shall be reviewed to review the presence of glacial till or similar layers exist. If these layers are present, then a Pile Soil Interaction (DRIVEN) Analysis shall be performed to verify if pile resistance capacity is reached at a higher elevation due to pile friction capacity. Structural design checks which include lateral loading and bending shall be accomplished using the appropriate resistance factors. The required nominal axial pile compressive resistance must be calculated and shown on the final plans. The factored nominal compressive resistance will be used to verify the pile group layout and loading. The required nominal axial pile compressive resistance will be used in construction field verification methods of nominal axial compressive pile resistance. Practical refusal is defined at 20 blows/inch. Driving should be terminated immediately once 30 blows/inch is encountered. See EPG 751.50 A1 Design Specifications, Loadings & Unit Stresses for appropriate design stresses to be included in the general notes. See EPG 751.50 E2 Foundation Data Table for appropriate data to be included in the foundation data table and any additional notes required below the table. This page was last modified on 19 February 2019, at 13:48.